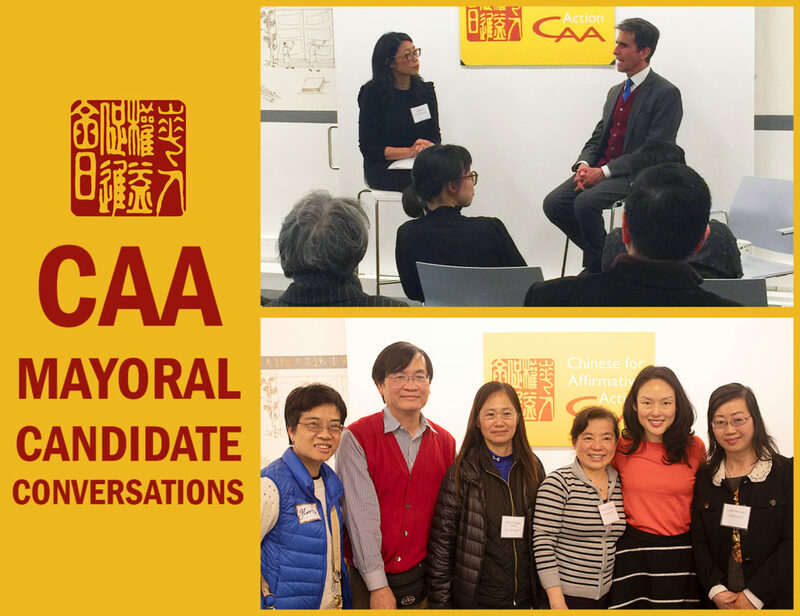 CAA hosted two Mayoral Candidate Conversations this past April with San Francisco Supervisor Jane Kim and with former San Francisco State Senator Mark Leno. With the Mayoral election on the horizon, it was an opportunity to discuss with them their past and ongoing work with CAA and others to address community concerns and advance civil rights. CAA Co-Executive Director Cynthia Choi led the conversations with Kim and Leno on both nights on topics including immigrant rights, language access, police accountability and sustainable jobs. Both candidates committed to uphold sanctuary protections and prioritize language access for immigrants, and outlined their plans for addressing San Francisco’s housing and homelessness crisis. Senator Leno also shared his idea for making San Francisco State University tuition-free for local residents while Supervisor Jane Kim touted her leadership in making City College of San Francisco free. Addressing the issue of higher education scarcity, affordability, and accessibility while also reaffirming our commitment to affirmative action has been a priority for CAA. Supervisor Kim also described her current leadership for Proposition C, which moves San Francisco towards universal childcare. Invited CAA guests including participants from our leadership development programs also directly interrogated candidates about confusing housing applications, language accessibility of public services, and the well-being of the Chinese immigrant community. Both Kim and Leno committed to continue working with the immigrant and civil rights community and CAA to make the city more sustainable and equitable. Yes on Prop C, Universal Childcare: Prop C will raise money for a Babies and Families First Fund to strengthen childcare services. The fund will help families, especially immigrant communities, access quality and affordable early child-care services, education, social services and early childhood development programs. Yes on Prop D, Housing for All: Prop D will raise money to establish a Housing For All fund that will address the housing crisis and homelessness in San Francisco. The fund will increase low-income and affordable housing, provide subsidies for senior housing, legal representation for tenants facing evictions. Though Prop C and Prop D are considered competing measures, we believe it is important for at least one of these measures to pass and therefore we support both. 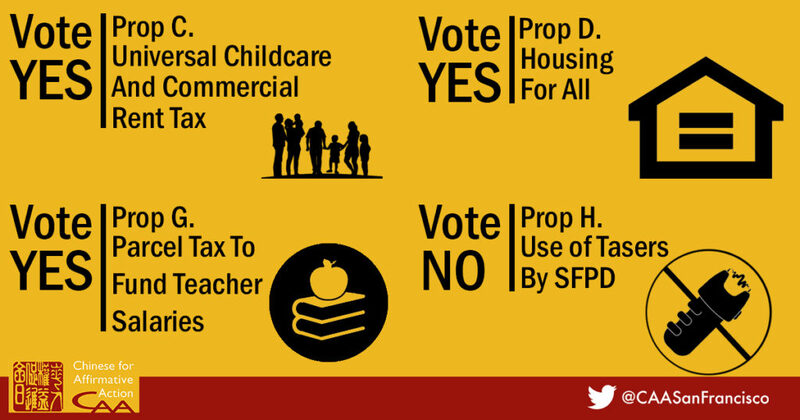 Yes on Prop G, Wage Increase for Educators Prop G will raise money for SFUSD to institute a living wage for teachers and paraeducators to meet the increasing cost of living in San Francisco. Educators, students and families will all benefit through Prop G will increased staffing, professional development and digital teaching and learning tools in SFUSD. No on Prop H, Tasers for SFPD: Prop H circumvents civilian oversight of the San Francisco Police Department to give tasers to officers without sufficient safeguards. It also further weaponizes law enforcement in a manner that will harm community members, especially those most vulnerable to excessive police force.